Note: Pattern correction made on 10/1/2006. Can't always read my "chicken scratch" notes when transcribing into the blog. 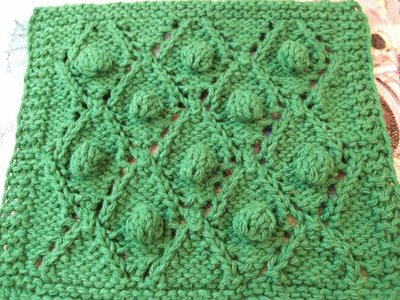 Using ww kitchen cotton yarn, and US7 (4.5mm) needles, cast on 37 stitches. Repeat Rows 1 to 16, twice. This Bonbons et Calissons Dishcloth pattern is pretty easy. The only trick is minding your Yarn Overs. MB = K1, YO, K1, YO, K1 into the same stitch. Turn work, P5. Turn work, K5. Turn work, P5. Turn work, SSK, K1, K2Tog. Turn work, P3Tog. Turn work. With yarn in back, slip the bobble stitch from left needle to right needle. BTW, the picture above has a 4 row garter border instead of a 6 row garter border. that is one of the most gorgeous washcloths I've ever seen! I do not use my 'dishcloths' for dishes, they are too precious. I only use them for gifts for and for the bath - spa cloths, as you asked about a while ago on the dishcloth KAL. That is a very nice cloth! I really like it and will have to try it out. Thanks for sharing the pattern! so lovely and it's a french name of bonbons... sure, i'm french!!!.... and i don't speak english o so little..; your blog is super, thank you, i have a blog too and i put your's in my favorite , my blog's name is:lalainedeghislaine.over-blog.com. I had a hat (my grandmother made many years ago)that had similar bobbles on it. Someone stole it from my daughter on our vacation to Paris, while INSIDE Notre Dame Cathedral! Now I am desperately trying to find a pattern to make a new one. Is there any way I can send you the picture to see if you have a pattern like this?